Nike stuck with Lance Armstrong to the bitter end and has backed through thick and thin golf demigod Tiger Woods, the keystone of its golf program. But the brand moved with remarkable expedience (for Nike) to suspend its relationship with Olympian and Paralympian Oscar Pistorius, on trial for allegedly murdering his girlfriend. No need to rehash the news, since the star -- really needing no introduction the world over, as ring announcers used to say to introduce Mike Tyson -- has been all over the news. It's not the final straw for Nike ... yet, per a company statement, which is as terse as can be expected for a situation like this: "Nike has suspended its contract with Oscar Pistorius. We believe Oscar Pistorius should be afforded due process and we will continue to monitor the situation closely." But it can't help that Pistorius has admitted to having shot his girlfriend, the model Reeva Steenkamp, ostensibly mistaking her for an intruder. Is Nike taking a more balanced "innocent until proven guilty" position, or acting quickly to distance itself? Is there a moral imperative for brands to assume a sponsored athlete is innocent until proven guilty? No, say marketers and analysts. 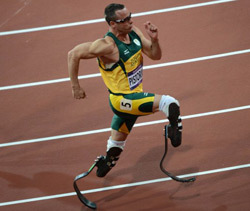 David Steinberg, founder and CEO of Manhattan-based marketing firm XL Marketing, says Nike has probably stuck by athletes too long in the past, and is now acting expediently to back away from Pistorius. "Yes, it's a knee-jerk reaction, because in the past they have stood by athletes and it has come back to burn them," he says. Nike has been a long-term sponsor of Tiger Woods, as he is a massive part of their golf strategy. The obvious difference between Woods and Pistorius: unless Florida law asserts that marital cheating is a crime, he didn't break the law. "And they couldn't really terminate him without essentially shutting down their golf division." And like buying more shares of a stock at a low point, it has paid off long-term as he has renovated his reputation. On the other hand, Nike was chastened by having stuck by Armstrong for over a decade, keeping him in the spokesperson/sponsorship stable all the way up until he severed his relationship with LiveStrong last October because of “seemingly insurmountable evidence” that he had been doping, and by not admitting that had misled the company. Nike wasn't alone. RadioShack and Budweiser also dropped him around the same time. At the time, analysts were unanimous in asserting that the Armstrong brand had suffered a fatal keelhauling.